Temperature dependence of surface tension can be used for the routing of fluid droplets over patterned surfaces. Surfaces are patterned with either hydrophilic or hydrophobic contact angles such that the fluid droplet is restricted to follow a channel formed by the hydrophilic-hydrophobic interface. Additionally an array of micro-heaters, heated in a programmable fashion, cause the thermocapillary actuation, propelling the fluid droplet away from the hotter region towards the colder region. The images below show the top and cross-section views of the problem setup (Anton A. Darhuber et al.) followed by the setup in FLOW-3D. Top-view of a liquid droplet moving along a hydrophilic microstripe. 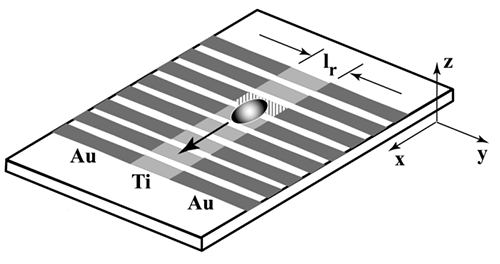 The array of Ti-resistors (shown in light gray) beneath the hydrophilic stripes locally heat the droplet thereby modifying the surface tension and propelling the liquid toward the colder regions of the device surface. The dark gray stripes represent the leads and contacts (Au) for the heating resistors. 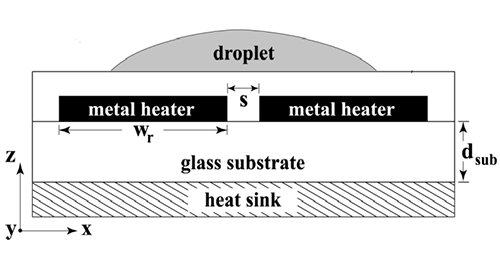 Cross-sectional view of a portion of the device containing two micro-heaters and an overlying droplet. A region of cooler surface temperature maintains a higher surface tension than the neighboring warm spots, exerting a tangential surface force pulling the liquid. 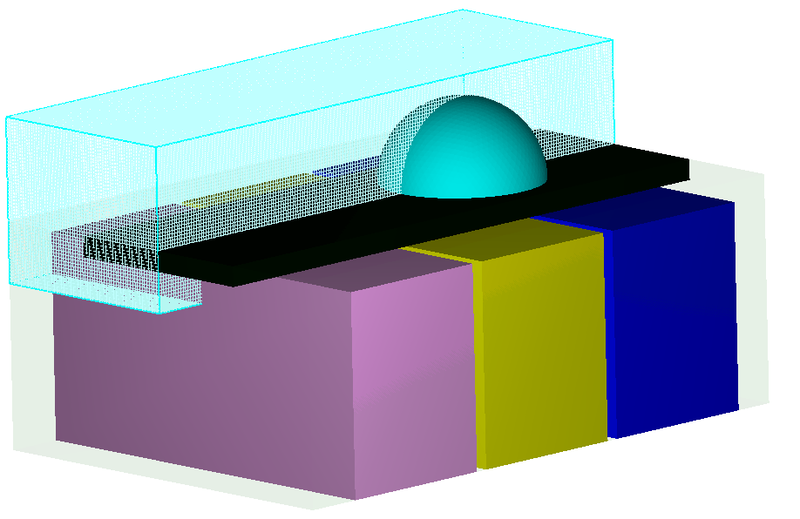 Partially wetting (contact angle > 0) surfaces are a desirable option because they allow the fluid transport with lesser volume loss compared to a full-wetting surface (contact angle = 0). Top view of the setup in FLOW-3D showing three microheaters in pink, yellow and blue respectively. The central hydrophilic strip is shown in black with a fluid (water) droplet in sky blue. The animation below shows a comparison between a fully-wetted and a partially-wetted surface. As expected, the fully-wetted surface makes the droplet flatter (and more spread out) than in the partially-wetted surface. As the heaters are activated one at a time, the droplet is propelled towards a colder area. It can be seen that the fully-wetting surface loses more fluid volume by the end of the simulation as more fluid is left behind. Therefore, partially-wetting surface is a more preferable option to reduce fluid loss. In both cases, the droplet is forced to stay in the middle because of the central hydrophilic strip surrounded by a hydrophobic surface.